Instead of writing this, I really think you guys need to hear the story for yourselves. It’s a HolderVLOG (please someone come up with a better name). I grew up in an incredibly crafty, do-it-yourself family. Long before Pinterest, my mother and grandmother went to the store and bought patterns to make a lot of our clothes. Before home improvement superstores, my father would take on massive projects around the house.. for fun. The house needs a new roof? Bathroom need new tile? Why pay someone to do it when you have two hands to do it yourself. Fast forward a few years. I marry a guy that is CLUELESS. He admits it. So that means if something is broken in our house I dive in to make the repairs. Penn even pokes fun at my Pinterest obsession. I mean… what’s not to love? The JOY in finding a perfect “pin” and the inevitable TEARS when it doesn’t turn out anything like the picture. I’ll admit — I have an unhealthy relationship with Pinterest. I have more Pinterest #FAILS than successes. Still.. it’s Autumn. This time of year just calls out to the craftiness in my genes. But this time — I wanted my dear husband to give it a try. I found a great wreath I wanted to duplicate — and of course, there were no step by step instructions. Of course. So here’s his first try at a Pinterest craft. You have to watch until the end. Classic. Have more crafts he should try? Leave a link in the comments. Penn and I had everything we needed growing up. We didn’t necessarily have everything we WANTED (Guess jeans, a real Members-Only jacket, and Michael Jackson parachute pants), but our parents did everything they could to make sure we had the necessities (we got those jeans with the upside down triangle, a generic jacket with zippers, and a pair of pants that squeaked when we walked). Now that we have our own children, we realize our own parents were onto something: There’s enough stuff; experiences are what matter. That’s why we try to bring the kids along for any opportunity to travel with our day job. Our company, Greenroom Communications, was hired to provide digital strategy and a social media launch for the Legends of Oz DVD release for Fox Home Entertainment. We have a team of social media ninjas who developed an AWESOME plan that included a Friday night Twitter party and a Saturday morning double-decker sing-a-long bus ride throughout New York City. 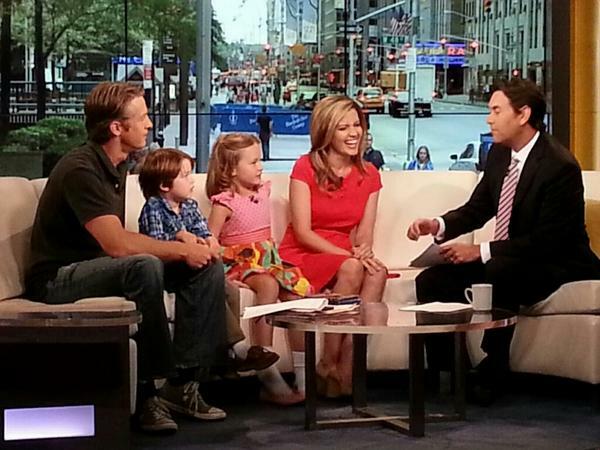 At the same time, we were invited to be on Fox and Friends Saturday morning to talk about our newest family video. I suppose I just wanted them, at age four and seven, to be grateful for these opportunities. Remember, Penn and I decided if we had the means, our children would have amazing EXPERIENCES (I’m saying this with jazz hands and spirit fingers — “EXPERIENCES!”), not necessarily more STUFF. And THIS was it — THIS trip was an experience. EXPERIENCE IT, KIDS! But soon, Lola had enough of the “experience.” (She’s so much like me it’s scary). While Penn and our son get their energy from being surrounded by people, Lola and I need quiet time to recharge. I had spent so much time saying, “We didn’t do this when we were kids” that I forgot — we DIDN’T do this when we were kids. we never took an airplane to New York City for the weekend as children. We never appeared on national TV when we were growing up. We never saw our dads perform on a double-decker bus as children. Yes, these were great opportunities, but it was a lot for my little people. About an hour into the bus tour — Lola was done. She wanted off. So that’s what we did. Penn stayed on to lead the crowd in song — Lola, Penn Charles, and I walked back to the hotel. Lola didn’t want to hold hands. 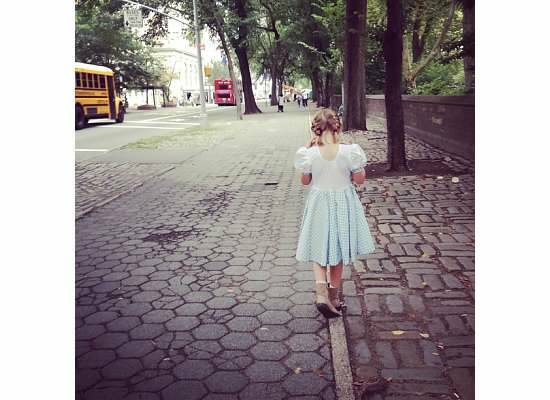 She wanted some quiet time ten feet in front of me (on crowded Manhattan streets). There was still so much to EXPERIENCE, but we closed the shades and tuned out the world for a bit. It’s what my girl (and I) needed. Well, ummm . . . okay. Next, we hit the city as a family. We found the spot where Penn proposed to me years ago. We rode the carousel in Central Park. Stopped by the Plaza, where our favorite six-year-old Eloise used to hang out. We even had time to see our girl, Lady Liberty. Lola actually cried when it was time to leave. She said while wiping the tears from her face, “Promise me we can do this all over again soon.” There’s a tug on my heart when she cries. But this time, I must admit I was a little relieved. It had never occurred to me that these “EXPERIENCES” wouldn’t be 100% positive for our children, but I was grateful she was going to remember this trip fondly. We don’t just make ridiculous videos, dancing in our pajamas or channeling Sir Mix-a-Lot. We are, in case you were curious, a full-service production and Digital Marketing Company called Greenroom Communications. We make entertaining, highly shareable videos for companies around the world (so far, FOX Home entertainment, Shari’s Berries, H&R Block, Hasbro). and here’s the Greenroom Communications website. It is the panicked thought that goes through every dad’s mind, one hour before your family comes back in town. About once a year, dad is left home alone, and many of us take that opportunity to revert to our primal selves – We eat horrible food, we don’t make the bed, we meet up with the guys, we clean up NOTHING – that is, until about an hour before they get home. 1. This was real – actually shot while my wife and kids made a quick trip down to Disney – the mess is real, the story is real, and thank goodness I have a tripod, because I had to photograph myself. 2. The guy who looks like Jason Sudekis is my buddy Jake Fehling – we are working on a Holderness Family spinoff called “Rapping Dads” – more to come. Dads/Moms – does this sound familiar? Comment below.